creative, fun, healthy, innovative, competitive, dynamic, and fast-paced. treatments to fountains, and more. Due to the rapid growth of the water garden market, Aquascape embraces a cultural philosophy of building a balance in life. For over 10 years, Greg Wittstock – founder and CEO of Aquascape – had a dream of building a workplace utopia that would allow his employees to have fun while facing the stress and demands of a fast-paced industry. The balance between hard work and playful fun was embraced by designing a building that speaks to all aspects of human nature. Educational and technical resources feed the mind. Physical fitness areas challenge the body. Water features and nature soothe the spirit. Because the mind, body, and spirit are all nurtured in the company headquarters known as Aqualand, a collaborative atmosphere of teamwork is enhanced and strengthened. In 2002, Greg Wittstock, aka The Pond Guy, gathered together a group of key employees and formed a Visionary Committee to start the ball rolling on the Aqualand project. The committee met with Terry Martin, architect from Artisan Design Build, for several hours to identify what vital elements the employees felt would be needed to achieve a workplace utopia. Harmony, balance, and environment were key concepts for everyone. From ergonomically correct workstations to natural surroundings, Terry formulated the blueprint that had been Greg’s dream for over a decade. Part of that dream was to ensure that employees had a hand in designing their home away from home. Greg met Terry at a nearby tradeshow, and in usual Pond Guy fashion, drilled Terry on his creativity and architectural savvy. “To be honest, I first liked Terry because he had cool hair,” admits Wittstock. The two exchanged phone numbers after a brief moment of dialog. Martin was convinced this new lead would go nowhere, and was genuinely surprised when Greg called him to join their Visionary Committee for a day of exploration and brainstorming. 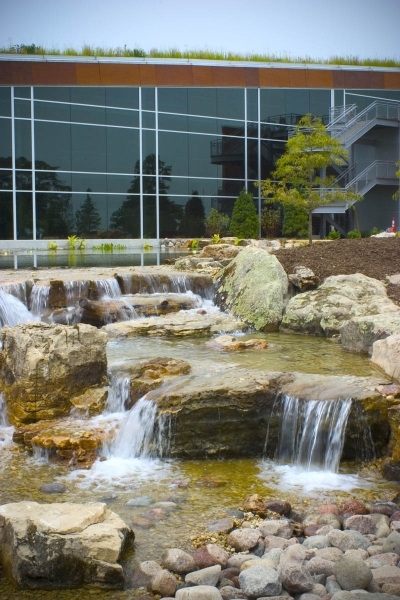 Terry returned to his office in Wisconsin with a clear vision of Aquascape’s workplace utopia. Soon, he had created a blueprint for an eco-friendly building that housed the same cultural philosophy as the Aquascape business. Innovative workspaces intermingled with pockets of play area – providing that much needed balance between a highly competitive business and the softer side of life’s leisure activities. The environmentally friendly wedge of a building makes use of sustainable materials throughout, ensuring the securement of LEED® (Leadership in Energy and Environmental Design) certification for Aqualand. The LEED® Green Building Rating System® is a national standard for developing high-performance, sustainable buildings. 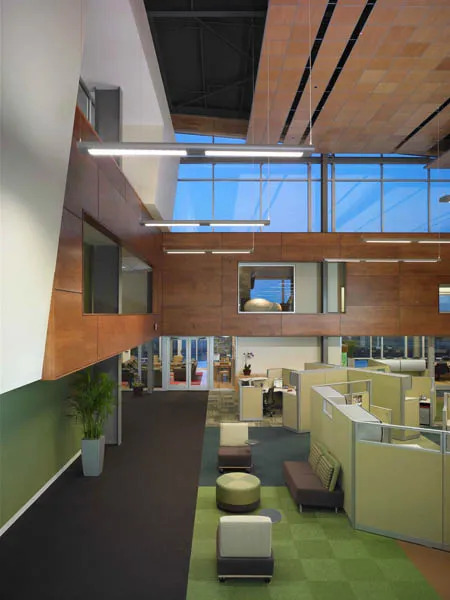 Through LEED®, strategies for sustainable site development, energy efficiency, water savings, materials selection, and indoor environmental quality are emphasized. Aqualand is a 256,000 square foot eco-friendly building that houses office and warehouse space. The roof is the largest sloping green roof in North America, planted with native prairie grass and flowers and a complete irrigation system. The eastern floor-to-ceiling glass windows are 15 feet tall at the southern end, and 40 feet tall at the northern end. A custom water wall, designed by Terry Martin and Greg Wittstock, greets visitors upon entering Aqualand. The bamboo forest in the reception area ties in with the bamboo flooring. Interior design firm PSA Dewberry worked closely with a newly formed group of Aquascape employees, called the Interiors Committee, to develop the finishing touches of Aqualand’s interior. The design philosophy for the interior aesthetics of Aqualand embraces bringing the Illinois prairie inside. The carpet and Marmoleum® flooring reflect an aerial view of Illinois landscape. Large, patchwork squares mimic farm fields and prairies as they roll across the floor in colors of tan, green, brown, and pumpkin. The outdoor pond flows into the building via waves of blue carpet. Green cubicle walls lend themselves to a second dimension of meandering groves of trees and bushes. Upholstered seating provides pops of color reminiscent of flowers in a meadow. Aqualand houses a 5,000 square foot fitness center, complete with spa and locker room facilities. A big screen plasma television is tucked into a corner of the fitness center, with Love Sac seating for TV viewing or informal teaming sessions. Just off the fitness center is a children’s play area, so employees can work out while little Johnny or Julie plays with a variety of toys. In addition to the fitness center, a soccer court, sport court, and racquetball court are available for employees to burn some steam or bond with fellow employees.